one of my favorite photographs of all time. 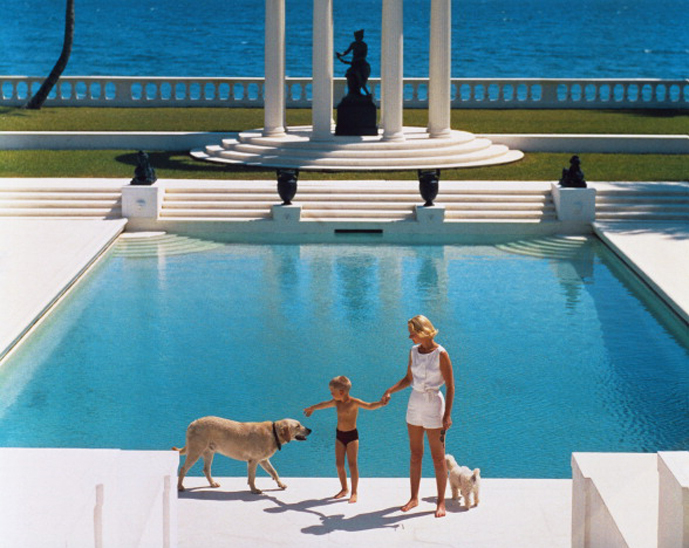 One of my favorite photographs of all time is this one by Slim Aarons. In it, C.Z. Guest is photographed along with her son at their Palm Beach estate in 1955. If ever a photo exuded a sense of opulence, I think this one does. The huge, marble-decked swimming pool, the manicured lawn with views of the ocean beyond. CZ with her perfectly coiffed hair—so chic with those long slim gams. Those hard shadows letting us know it's a bright sunny optimistic day in paradise. Everything is so symmetrical. Oddly, if it wasn't for the dog roaming into the shot—who knows if it would be as beautiful. Slim Aaron's famous photograph of C.Z. Guest in 1955. If opulence was ever captured in a more elegant, and yet casual way, I've yet to see it. Some of the best editorial photos are created when something unexpected and spontaneous happens. It's those "REAL" moments that create the uncontrived images that we have a desire to look at over and over. A few years ago we photographed C.Z. 's daughter Cornelia Guest for Genlux's series called 'The American Socialite.' Cornelia was the 80s Debutante of the Decade. She ran with the likes of Halston, Andy Warhol, Liza Minnelli and the Studio 54 gang right about the time the club closed. Yes, my friends, she has stories. She was also only about 16 at the time, so who knows where C.Z. thought little Cornelia was. The beautiful Cornelia Guest for Genlux's 'American Socialite' story photographed by BrakhaX2 in our Fall 2012 issue. I'm confident this is the first (and last) time she's ever held an iron. Notice her stable grip on that handle. Cornelia Guest is passionate about two things. Her dogs. And her animal-free collection of handbags—some of the nicest designs on the market. Touch 'em and you'd swear they were leather. Here, she's wearing a pink Valentino couture gown, $23,000, in the Genlux Fall 2012 issue. Tomorrow we're shooting our modern-day version of C.Z. Guest here in Beverly Hills. Our socialite is Carla Sands. A beautiful statuesque woman known for her style and philanthropy. I'll fill you in later on the shoot. The other day I said that I'd share our new cover with you. As passion and photographer would have it, we're still in retouching—so it will have to wait a day. Or two.